The Academy of Nutrition and Dietetics says all foods can be included in a healthy diet. 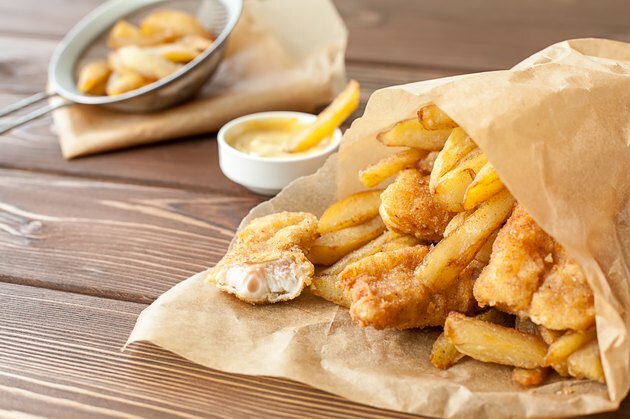 Fish contains many essential nutrients, but fried items are generally considered unhealthy because of high fat and calorie content. Fried fish should be consumed in moderation as part of a healthy lifestyle that adheres to federal dietary guidelines for diet and exercise. According to the United States Department of Agriculture's national nutrient database, a 3 ounce fillet of fried fish contains approximately 211 calories, 11grams of total fat, 2.5 grams of saturated fat, 15 grams of carbohydrates, 13 grams of protein, 1/2 gram of fiber, 484 milligrams of sodium and 31 milligrams of cholesterol. MyPlate says one fillet of fried fish is equivalent to 3.5 ounces from the meat and bean group and 1/2 ounce from the grain group. Fish is high in unsaturated omega-3 fatty acids, which may lower your risk of heart disease. The American Heart Association recommends eating fish twice weekly to raise your intake of these healthy fats. Omega-3s may also improve cognitive development in children, decrease unhealthy triglycerides in your blood, lower blood pressure, improve immunity and reduce symptoms of arthritis. Fatty fish such as salmon, herring, mackerel, lake trout and tuna are especially rich in omega-3 fatty acids. Frying is a cooking method that traditionally involves using lots oil, which is high in fat and calories. According to the USDA, diets that are high in fat and calories are associated with an increased risk of obesity, heart disease, cancer, diabetes, stroke, immobility, sleep apnea, osteoporosis, liver and kidney disease and breathing problems. Occasional fried foods are OK, but they should be balanced with lower-calorie foods throughout the day. Healthier cooking methods that limit the use of oil include grilling, broiling, steaming, baking, roasting and poaching. Exercising portion control is important when eating fried fish to prevent excess calorie consumption. According to the American Cancer Society, one portion of fish is 3 ounces, about the size of a checkbook. Portion control is especially important when eating out, because restaurants often serve over-sized portions. The Academy of Nutrition and Dietetics recommends sharing entrees and appetizers, and eating more slowly to avoid overeating. Fried fish is often served with high-calorie, high-fat condiments and sides like mayonnaise, tartar sauce, cheese, sour cream and French fries. The Academy suggests serving condiments on the side to control the amount you consume. Healthier condiments for fried fish include lemon or citrus juice, salsa, low-fat mayonnaise, fat-free sour cream, spice blends and fresh herbs. The healthiest sides for fried fish include fresh fruits and vegetables and whole grains, because they are are rich in essential nutrients and naturally low in calories and fat. MyPlate.gov: What Foods Are in the Protein Foods Group?